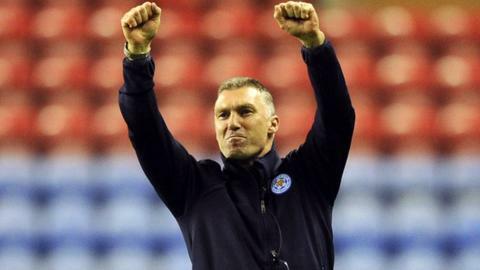 Leicester City boss Nigel Pearson has "no intention" of signing many of the players linked with the Foxes since they won promotion to the Premier League. Pearson said most people would probably never have heard of his real targets. "As soon as we [secured promotion] agents link us with players, I have absolutely no intention of following up," he told BBC Radio Leicester. Manchester United striker Federico Macheda is among the names mentioned. Macheda is currently on loan at Birmingham City, where he has scored nine league goals in 13 appearances. Other sources have claimed Bolton midfielder Mark Davies has been involved in talks over a £2m move to the King Power Stadium. With nine City players and Pearson himself out of contract at the end of the season. the situation at the club remains fluid. But Pearson said: "The vast majority of the names we're looking at you've probably never even heard of. "Our recruitment strategy is exactly the same as it was before, it is just that we may be able to move a little bit quicker. "We have an opportunity to maybe do a little bit of early business, but some of the names I've been told we've been linked with I've laughed at. "Some of those names probably aren't in the right sort of shape to get in our side to start with." Read more on Who is Federico Macheda?